When you purchase your Office Furniture from ONCEnvironmental Office Furniture Solutions your order immediately gets placed into our delivery schedule for your area. You will then receive a call from our Logistics Team Manager, Steve Shaw, to agree the actual delivery date, and time, subject to local traffic conditions, on the day. 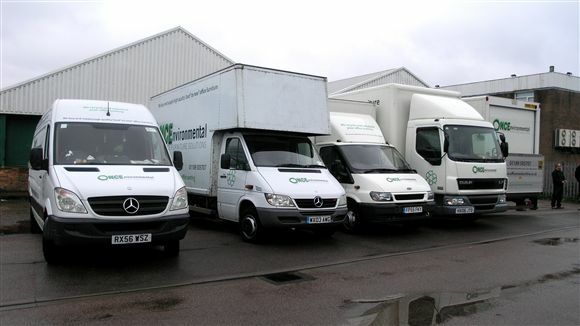 The delivery cost, subject to schedule, within the M3/M4 Corridor, inner, and outer, M25 Orbital and M40/M6,M1 corridor is normally covered within the purchase price of your furniture and you can be confident that everything will go to plan as we prefer to ship, and install, using our own Fully Trained Logistics Team, to ensure that your choice will meet your expectations. Where you require an urgent delivery, or are outside our normal delivery schedule area, or we cannot meet your deadline, we may use outside contractors, and there will be an additional shipping charge. If you feel that you may need to confirm that you are within our scheduled delivery areas then please DO NOT PAY ONLINE until it has been confirmed. All Office Furniture, except where there has been prior agreement, must be paid for before, or on the day of, Delivery and Installation. ONCEnvironmental Office Furniture Solutions accept all major credit cards and we can supply our Bank Details to Bona Fide Businesses should they wish to pay by Direct Same Day Credit on, or before, Delivery Date. Credit Facilities are available subject to criteria.